Offers one-on-one presentation skills and image enhancement training to corporate CEOs and executives and provides internal communications and customer service seminars to executives and their operating staff. Ambler, PA. Youth football and cheer, includes news, schedule, and photo album. Ambler, Pennsylvania based company offering cruises and tours with sailing and motor yachts. Vessel descriptions, operating areas, flight reservations, and rates. An independent, volunteer organization that provides baseball and softball programs for boys and girls ages 5 to 19 in Pennsylvania. Includes news, calendar, schedule, standings, history, rules, handouts, and team and division information. Essay on Unified Modeling Language presented as insufficient for developing real-world business applications, by Scott W. Ambler. Includes other resources on Agile Modeling. An AmbySoft Inc. white paper by Scott W. Ambler. This design reflects authors several years of experience building and using persistence layers in several languages. Step-By-Step Handbook for Developing Robust Systems Using Object Technology. Written in everyday language and covers topics that are pertinent to real-world developers. This book is written from a developer perspective. By Scott W. Ambler, SIGS Books. Delivering Large-Scale Systems Using Object Technology. Discusses how the entire object-oriented development process works. Covers the Deliver phase and the Maintain and Support phase of OO development. By Scott W. Ambler, SIGS Books. Building Large-Scale Systems Using Object Technology. Covers how the object-oriented development process works. Shows a detailed view of the Initiate and Construct phases of OO development, the phases where software is built. By Scott W. Ambler, SIGS Books. 19 South Ridge Ambler, Pennsylvania. Ambler, Pennsylvania. This contemporary congregation operating as a ministry of the First Presbyterian Church of Ambler offers a description of its mission and services and directions. Research database including photographs, census records and document transcripts. Provides an introduction to the church including a welcome from the Rector, contact information, Worship schedules and related links. Irish pub and restaurant in Ambler, Pennsylvania. Features a fusion of Irish and American cuisine, relaxing and friendly environment, and Irish entertainment. filmography as writer and producer. Offers news, biography, photographs, articles and interviews, and a forum. brief biography and bibliography with short synopses of some titles. 29 Ambler, Tim Irish-based singer/songwriter. Irish-based singer/songwriter. Web site includes gig details, discography and biography. Guitarist/songwriter active in the Irish live music scene. Information on the site includes the biography, news, discography, schedule, gallery, and contact information. SiteBook Ambler City Portrait of Ambler in Alaska. 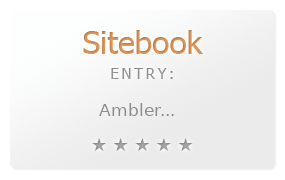 This Topic site Ambler got a rating of 4 SiteBook.org Points according to the views of this profile site.